In an analysis bolstering the arguments of those fighting for minimum wage hikes nationwide, a group of University of California-Berkeley economists has found that Seattle's decision to gradually raise its minimum wage to $15 an hour has not hampered job growth, despite the frequent warnings of doom-and-gloom critics. The study, released on Tuesday, examined the effects of the incremental wage increases in 2015 and 2016. After analyzing Seattle job data prior to the wage hikes - which were signed into law by Seattle Mayor Ed Murray in 2015 - and after they began to take effect, researchers found "no evidence of job loss in the city's restaurant industry, even as pay reached $13 for workers in large companies." 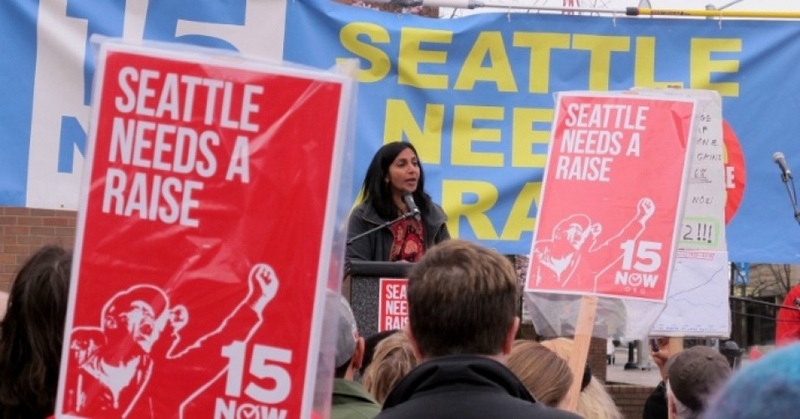 Professor Michael Reich, lead author of the analysis, said the Seattle wage hikes are "working as intended, raising pay for low-wage workers, without negatively affecting jobs." "These findings are consistent with the lion's share of rigorous academic minimum wage research studies," Reich concluded. The study's results come shortly following the decision of congressional Democrats to support the Raise the Wage Act of 2017, a measure introduced by Sen. Bernie Sanders (I-Vt.) that would raise the minimum wage to $15 nationally over a period of seven years and index it to inflation thereafter. "We cannot rest," Sanders wrote upon introducing the legislation, "until every worker in America has the right to make at least $15 an hour." On Tuesday, over 200 organizations joined Sanders and Democratic members of Congress in endorsing the Raise the Wage Act, according to a memo published by the National Employment Law Project. "At a time when wage stagnation and income inequality pose serious threats to our families and our economy," the memo states, "the Raise the Wage Act of 2017 would begin to reverse that cycle and raise pay broadly across the bottom of the workforce." * Sun-Times: As Small Business Owners, We Know: $15 An Hour Entirely Reasonable. Some Cities, Villages Opt Out Of Cook County's Minimum Wage Increase.